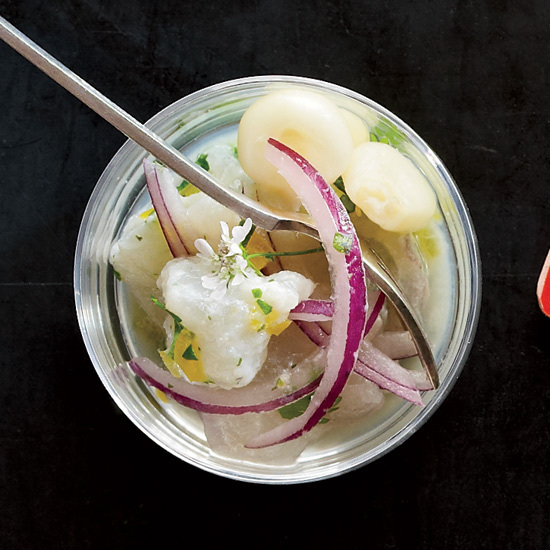 Cool ceviches and crudos are the best ways to enjoy freshly-caught fish in its purest form. Here are five excellent recipes to try your hand at after your next successful fishing trip. Here, chef Rick Bayless combines fish with lime and spicy chiles, then piles the mixture on tortilla chips. Chef Allen Susser prefers to use firm white-fleshed fish like red snapper for ceviches, because they keep their shape well. "Dice the fish into uniform pieces, so they cook evenly in the citrus juice," he advises. At La Buca restaurant in Cesenatico on the Adriatic coast, chef Matt Molina and his crew tried slivers of raw orata, a meaty local white fish, embellished simply with agretti pesto. Since orata is harder to find in the U.S., this recipe calls for red snapper. For these extra refreshing tacos, fish gets marinated in a mixture of tomatoes, citrus juices and chiles. The citrusy marinade turns the fish opaque, cooking the fish without any heat.